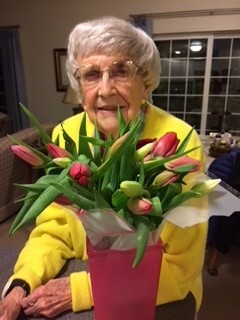 Mary Ellen Lyons Rose was born in Cresco, Iowa on April 28, 1921, to Florence Drewry Lyons and Gerald Edward Lyons and died on June 9, 2018 in Aurora, Colorado a few weeks after a wonderful celebration of her 97th birthday. She grew up in Cresco and in Washington, D.C. and had the pleasure of meeting President Franklin Roosevelt at a White House reception when she was 16 years old. She met her future husband, Eugene Arnold Rose, on a blind date while attending the University of Minnesota. They were married at her family’s home in Cresco on January 13, 1945. They had three children, Eugene Arnold Rose III, Mary Patricia (Mimi) Rose Glode’ and Scott Gerald Rose. The family lived in Omaha, Nebraska, White Bear Lake, Minnesota and Palatine, Illinois. She is survived by her children, Gene (Jan), Mimi (Mike) and Scott (Ann) and 7 grandchildren and 10 great grandchildren. Her husband predeceased her in June 2004. Her three brothers (Jerry, Tom and Bill) predeceased her. The family has fond memories of many summer trips to Canada and to Mary and Gene’s cabin on Stone Lake in Wisconsin. Mary was a great “fisherwoman” and had a mounted 10 pound walleye to prove it! Burial services will be held at a later date in the family plot in Cresco, Iowa. Contributions in her name may be made to the March of Dimes or the Lion's Eye Institute.